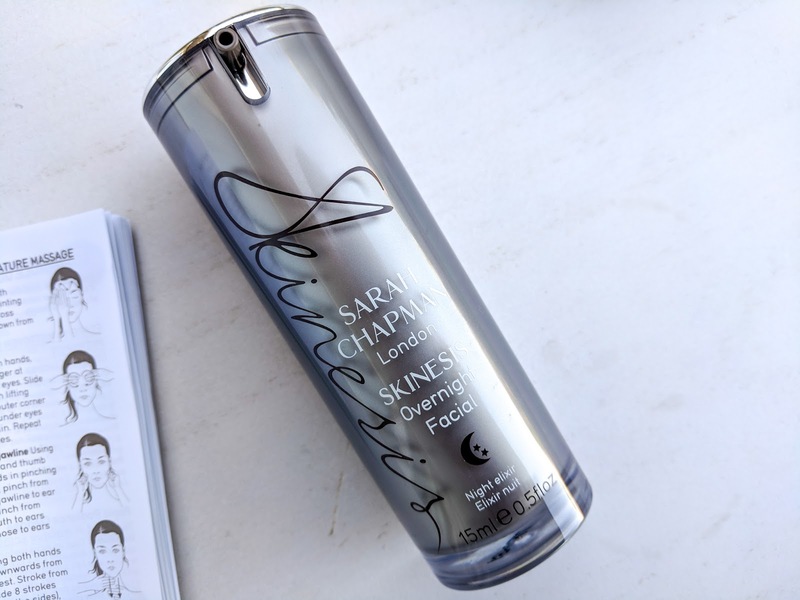 Prior to Overnight Facial, the only Sarah Chapman product I had any experience with was the Skin Insurance tinted SPF which is a product that I basically wore daily this Summer. I loved the effect and the finish of Skin Insurance, so it only made me more keen to try more from the brand. So now I've got Overnight Facial on the go and I've been using it most nights since I got it for my birthday two weeks ago. Thanks mum. The name is a bit of a giveaway, but this serum is designed for use at night. You just massage it in and let it do its thing while you sleep. An oil-serum formula, Overnight Facial was developed by Sarah Chapman to allow users to recreate the 'glow' of her famous Skinesis facials in the comfort of their own home. Pretty much nothing can compare to a really good facial but after trying this product for a couple of weeks, I can confirm that it comes pretty close - if only it came complete with an Indian head massage and ambient rainforest sounds. Since I've just turned 33, which we all know is very, very old, I have started venturing out into the world of Vitamin A. It's good timing then that Overnight Facial came into my life when it did, because it's a main feature of this serum. On top of Vitamin A, Overnight Facial is rich in anti-inflammatory omegas, antioxidants, a cocktail of vitamins including a stabilised version of Vitamin C and a brightening complex. The formula also features something called Renovage which claims to prolong the life span of cells and Dermaxyl which boosts collagen production via an advanced peptide technology. As well as all of these super ingredients, Overnight Facial contains a blend of jasmine, tuberose, rose and frangipani essential oils for a soothing scent. On the topic of scents, I read a few reviews of Overnight Facial that raved about the amazing way it smells but I'll admit that the first few times I tried it I didn't really even notice much of a scent. It wasn't until just the other night when I took the time to purposefully breathe in the scent after swiping it across my palms and holding my hands in front of my face that I actually understood what these people were talking about. I totally get it now. This stuff smells gorgeous. Pretty smells aside, the reason I wanted to write this review is because I'm thus far pretty impressed with Overnight Facial. I am convinced that in the short amount of time I've been using it, it has made a definite improvement on the overall texture and plumpness of the skin on my face. My crows feet (ugh I hate that term) next to my eyes are looking a lot smoother and sort of plumped out, which is quite remarkable because I have spent a large portion of the last few months squinting, thanks to that weirdly hot and sunny summer we've just had. The packaging has its good and not-so-good points. It looks sleek and modern and lovely,, and the airless pump means the integrity of the active ingredients isn't compromised. However, you also can't see the product at all until you pump it into your hand so you therefore can't tell when you're about to run out. Overnight Facial is £49 for 15ml, which does seem a lot for such a small amount of product but I've found that one pump is the perfect amount for my face. If you want to try it for yourself, Overnight Facial is available at Space NK, Look Fantastic, John Lewis, Feel Unique and Sarah Chapman.